Build your savings and improve your chances to WIN CASH with a WINcentive™ Savings Account! WINcentive™ can help to improve your money-saving habits in a whole new way that actually makes saving FUN. You'll feel rewarded by watching your savings grow and experience the excitement of the prize drawings! And, unlike playing the lottery, there's nothing to lose with WINcentive™ Savings because all of the money you deposit into your account is yours to keep! In addition to state-wide prizes, St. Paul Federal Credit Union will have guaranteed winners each month, each quarter, and each year. Monthly 3 members win $100—36 winners a year!! Quarterly 1 member wins $500—4 winners a year!! Annually 1 member wins $2500!! 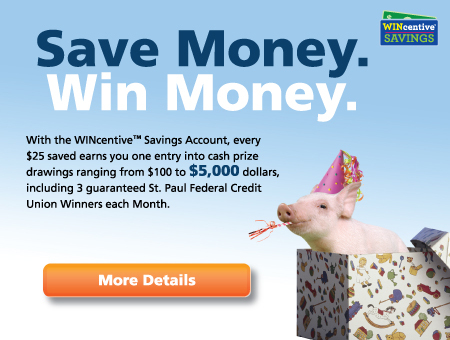 WINcentive™ Savings is a new prize-linked savings account at St. Paul Federal Credit Union. WINcentive™ Savings offers prize drawing entries each time you increase your WINcentive™ Savings Account balance by $25 (up to 4 entries per month)*. State wide prize drawings occur monthly, quarterly and annually - so the more you save, the more chances you have to win! You could even end up winning the state grand prize of $5,000! Drawings are held on the first of each month. See our Winners! Don't Miss Out–Open your WINcentive™ Savings Account today! *See Credit Union for complete terms, conditions, and official rules. Accounts are eligible to be opened after January 1st, 2016.